In 2012 I attended my first writer's conference, ACFW in Dallas. No plans to pitch at that conference, I was simply pleased to have finished my first novel and to sit at the feet of some of my favorite writing teachers. There were so many moments I enjoyed...from sitting in great classes to hearing valuable words of critique from some wonderful mentors...to great food and friends! 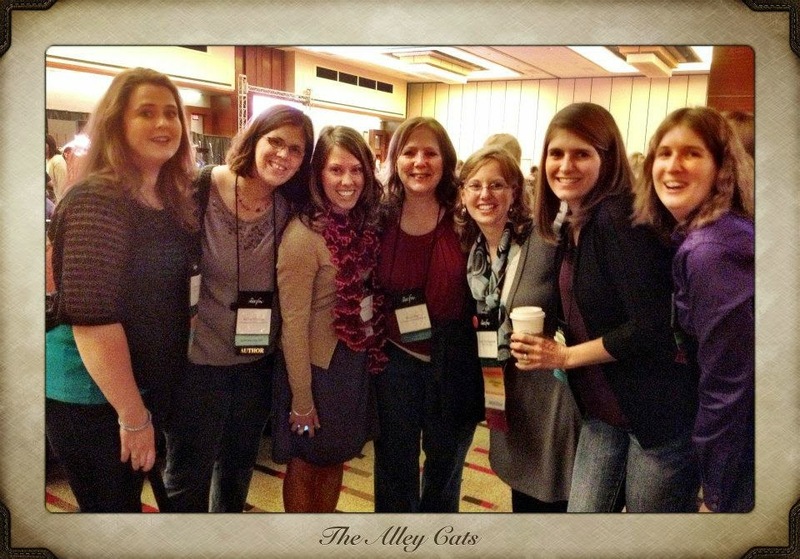 Including of course, the Alley Cats! But there were also the moments I retreated to my room feeling overwhelmed and drained all at the same time. The time I hid in the bathroom to catch my breath. The tears shed over a minor rejection that now seems insignificant. Navigating a conference can be no small feat for a writer, especially those of us who are introverted or struggle with anxiety. Here are the top ten things that helped me. 1) Know what you need to thrive and be proactive about it beforehand. What situations make it harder for you to be at your best? For instance, I know I can get stressed out if I am living on a deficit of sleep for multiple days. I tend to not perform as well if I'm operating on less sleep. So I'll plan to sleep on the bus on the way to Nashville and get extra in the days preceding conference knowing that I probably won't get an ideal 8 hours during my travels. 2) Realize that you'll be stretched. A special event like a conference isn't business as usual. We'll need to "do hard things" whether that means pitching your novel for the first time, hosting a seminar, meeting an agent. Walk in expecting it will be a challenge for you, but knowing you are not alone. God is there with you every moment. 3) Find a quiet spot to retreat to when you need it. The busiest times are always the times when we retreat the least and when we need to spend the most time doing so. Recognizing there will be so many temptations (many even good things), how can you be intentional to find time for Jesus? I looked for quiet corners in the hotel, even a bathroom will do. Jesus made time to escape and be with his father, we need to do the same. Consider waking before others in your hotel room or finding a quiet spot down the hall for morning coffee with Jesus to start the day right. 4) Carry the truth with you. It's so easy to do with technology. Do you have a Bible app on your phone? Proverbs 31 First Five and She Reads Truth are two fantastic examples of apps that provide short meditations. I also like to keep scriptures written on 3x5 cards in my purse. When I get anxious I'll take out a verse and meditate on a word or phrase. As I do this, I replace the truth of God's word with the lies I believe. 5) Think about someone else. The best trick for a stressed writer is to minister to someone else's needs. There are many struggling with anxiety over pitching, feelings of rejection after a meeting, frustration, envy, and a myriad of other issues. If you ask God to open up your eyes you'll notice those sitting in a corner feeling left out, those in the bathroom crying over negative feedback, and dozens of other situations. An encouraging word and a prayer is not only a blessing to the recipient but often even more so to the giver. 6) Don't go it alone. One of the best things about conference is all the great people you'll meet. Ask God to lead you to the people he wants you to meet. You might be surprised at who and why. Don't be afraid to be vulnerable. Sometimes admitting we are struggling with feeling anxious or rejected can be a great way to connect with someone else. Whatever we struggle with, others do too and we can be blessed when we are humble enough to ask for wisdom. Ask the multi-published author how she made it through rejection. Ask a trusted mentor how you can make your MC more believable. Tell another author you can't seem to find your way out of the plot hole in the middle of your novel. Then apply what you learned prayerfully. 7) Set time on your schedule to "process" what you learn at conference. Jot down a quick note here or there with the remarks an agent made to you about your first chapter and the technique you want to try after hearing a great lecture. There is so much happening and really very little time to process. Especially for those of us who are internal processors. Take time to decompress after conference and then within the next week revisit what you've learned. Maybe revisit it again a month later. The criticism that didn't seem so valid at conference is perhaps sinking in. 8) Make time for fun! If you struggle with stress or anxiety, having a little time for R&R in the midst of conference can go a long way towards building strength for those tension filled meetings. If you're a foodie, maybe its trying a new food in Nashville (I keep hearing about the hot chicken and I intend to try some if possible). Make time for laughs with friends, what better way to fight the blues of rejection or disappointed hopes. 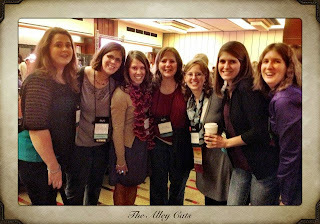 Conference is a wonderful, stressful, mixed-bag of emotions that all add up to an unforgettable experience. As we prepare ourselves let's be proactive about the spiritual, emotional, and writing struggles we may face. Julia Reffner is a freelance writer and reviewer living in central Virginia. You can find her writing at Library Journal, Wonderfully Woven, and The Writer's Alley. These are such great tips and reminders even for those of us who have attended multiple conferences! I am always so eager for what God has for me--and he always has--for each conference. And sometimes I don't realize what that nugget is until after I leave. But I rarely forget their importance. Can't wait to see you, friend!! I love this, Julia. Great reminders. As an introvert, I do lots of quick breathers in the restroom or in a corner by myself. This year I'm attending with several good friends who are first-time attenders. Focusing on them has helped me a lot! Blessings for a great conference! Wonderful words of wisdom. Although I have attended one writer's conference it was small compared to ACFW. Looking forward to meeting some wonderful people. CASEY, Yes! It is hard to get back to normal life and I know you have a super busy conference! Praying for you and can't wait to hug you! TERESA, Oh, boy, I get that. I"m always finding corners to hide in for a minute or two! Maybe these two introverts will bump into each other! PAT, Enjoy! It is overwhelming but a wonderful experience! Thank you for these insights. I needed to be reminded of every single one. Rejoicing at the opportunities ahead while I pray on the side for the Father's intervention. I so needed this! If only I could get more sleep before going. We are in the throes of the first week of school schedules and I naturally have trouble sleeping when a big event is looming. I am feeling quite anxious today. I am going to grab some verses and get settled to combat it. Thanks for your great tips and see you soon.